Abby the Librarian: OMG Anime Club! But seriously, guys. We had our first Teen Anime Club meeting last week and it was a HUGE HIT! 1. It drew in kids that I've never seen before. 2. It drew in high schoolers. 3. It drew in boys. 4. It was super easy to run. 5. I have a feeling that the anime club kids are going to be loyal and keep showing up. - An anime movie to play. I borrowed a few movies from our neighboring library system and let the kids vote on which one we'd play. 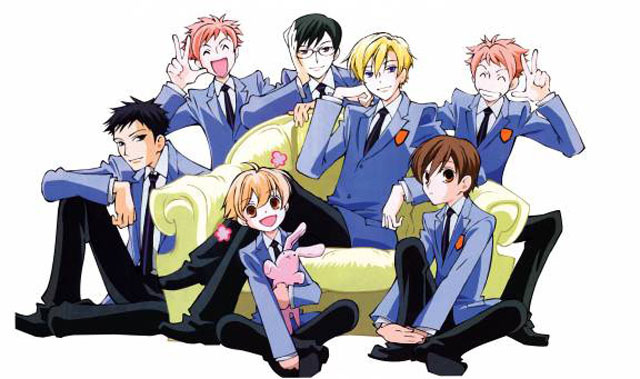 There was an overwhelming majority in favor of Ouran High School Host Club, so we put that one on. My library does not currently have an anime collection, but we got tons of suggestions from the kids, so we're starting one. - A display of manga books from the teen section. The kids kept poring over these all night, borrowing from each other, reading and swapping. It was awesome to see. Tons of them got checked out. And we got their suggestions for more manga to buy, too. - Drawing books, paper, pencils, and printouts showing different styles of anime hair, anime eyes, etc. A lot of the kids brought their own sketchbooks. Since our anime drawing books are almost always checked out, they skipped over the other drawing books we brought down and feasted on printouts we found on the internet. Do a Google image search for "anime hair" or "anime eyes" and you'll find sheets with a bunch of examples for the kids to copy. In this case, fruit punch and chips. In the future, we will probably serve something like Sprite that's colorless. Just sayin'. I also made sure to put out two clip boards: one to gather teens' suggestions of what awesome anime and manga to buy for the library (we got... so many suggestions... I hope we can track them all down...). The other to collect teens' contact info so we can email or call and remind them about the next meeting. At the beginning of the meeting, I introduced myself and my co-librarian. We voted on which DVD to put in. Then we got out of the way and let the teens do their thing. Some of them sketched, some perused manga, some sat and watched the show. Things got loud, but that's okay. We met from 6pm-8pm and about halfway through I went around to each group and introduced myself and asked their names. Around 7:45, we got to the end of an episode (we probably watched 4-5 episodes total) and I turned off the DVD and reminded them to put their contact info on the sheet and write down what anime and manga we should get. We got lots of suggestions from the teens for next time. A couple of them asked if they can wear their cos next time, which I, of course, encouraged. - You have to be really familiar with anime to run one. I don't know anything about anime, but the kids were more than willing to tell me all about their favorites and make suggestions. I was up front with them that I wasn't that familiar with it and they were okay with it. We also had a large range of fan levels. Some kids were seriously obsessed and some kids were more casual about it. - The kids will be "scary". I admit! I was a little intimidated by starting a new program that I thought would draw a whole different crowd. It did draw a different crowd and the kids are just as awesome and enthusiastic and sweet as our TSI kids (in kind of a different way, though). Do you have an anime club at your library? What are some of your favorite anime films/shows? Have you done any great crafts or activities? I want to hear about them!! Thanks for the post! I have had more than one request for a manga/anime club. I have read/watched a lot on my life, but wasn't quite sure how to go about it, like what a meeting would look like. This helps! I LOVE ANIME,MANGA BOOKS,DRAWING ANIME AND...I LOVE OURAN HIGHSCHOOL HOST CLUB!!!!!!!!!!!! Btw im in 5th grade.